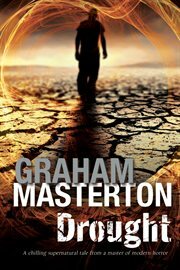 The item Drought, Graham Masterton, (electronic resource) represents a specific, individual, material embodiment of a distinct intellectual or artistic creation found in Austin Public Library. What would happen if the water ran out? Ex-Marine Martin Makepeace only learned the truth of the maxim that you don't know what you have until you lose it, the day his wife walked out on him with their two kids. Now, the social worker does his best to take care of those who need it most. But good deeds mean nothing when the water just . . . disappears. It hasn't rained for months, and now, in the height of summer, the taps run dry. And not, as they first suspect, because of a burst water main. In the deprived areas where Martin works, the water's been intentionally cut off. And it's his job, he discovers, to tell the families he cares for not to panic. Martin soon has more problems than lack of water. His daughter is sick with fever. And as riots over bottled water start, Martin's teenage son is framed, and arrested, for a terrible crime. Soon Martin is left with no choice but to take drastic action to save his family, while corrupt politicians try and use the situation to their advantage, with calamitous results . .